Presidents Message > Provectus Environmental Products, Inc.
Chapter 1. 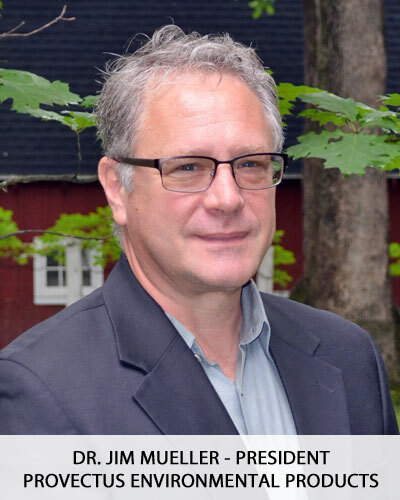 As some readers will know, I formed Adventus Americas, Inc. in 2003 to work with an established group of Canadian environmental scientists on building an international business to commercialize a core group of bioremediation technologies. Our initial specialization was on the treatment of organic contaminants and nitrogenous energetic compounds present in soil. Over the subsequent decade, we diversified our technology offerings through focused research, strategic partnerships, and corporate acquisitions. By working in close collaboration with many of you, we expanded our company’s operations geographically and helped manage a diverse range of environmental challenges throughout the world. Success (as well as failure) mandates change, and The Adventus Group was sold to FMC Corporation in November 2011 which, in turn, divested the business unit as part of a larger initiative in March, 2014. At that time it was clear my job there was completed. Distinctive Environmental Biotechnologies that Work = The Provectus line of environmental remediation products are truly different, and they represent genuinely unique chemistries: they are not simply “me too” modifications of existing environmental technologies. As you review our technology portfolio, common features will be apparent: a clear focus on safety, tangible cost efficiencies, demonstrated effectiveness, distinguishable ease of use, and recognizable quality at the highest level. Credible Technical Aptitude = Highly qualified staff, including Ph.D. level scientists and others representing more than 150 cumulative years’ experience with environmental biotechnology; inventors and developers of multiple physical, chemical and/or biological remediation technologies. Predictable Remedial Performance = Patented and Patent-Pending technologies. Guaranteed performance and other warranties offered in conjunction with strategic providers and partners. Responsive Customer Service = Logistics with no surprises, no excuses, no frustration. User-friendly and cordial account management personnel. Quantifiable Client Value = Safer, more effective, more cost-efficient remedial actions. “Do it Right the First Time” – avoid problems associated with new and emerging regulations for methane in groundwater, soil gas, and indoor air. I am committed to leading this effort with the same level of technical aptitude you have experienced over the past 20+ years. I promise to provide an often missing focus in our industry on truly exemplary customer service reinforced through candid, scientifically defensible client interactions. For those clients keen on employing Green and sustainable remedial solutions, our participation in the worldwide SuRF forums will help ensure that their values are appreciated. As you will read in this first of many newsletters, our initial outreach for strategic collaboration and technical synergies has met with overwhelmingly positive replies. I am very grateful for the rapid acceptance and support received from respected colleagues and valued clients. If the first 3 months are reflective of our future, then it is a very auspicious one indeed, and we will rapidly meet our goal of positioning Provectus in its leadership role. Onward and upward. As FY 2014 gets relegated to history, our industry has witnessed some surprising changes associated with mergers, acquisitions and personnel changes – along with the introduction of Provectus Environmental Products, Inc. and our truly new technology offerings. A critical review of personal events that occurred over the preceding 12 months offered me valued lessons learned. If you are interested to share in these perspectives… read more. A major event in my professional career took place on April 15, 2014 when I resigned employment after my company heritage and long-term career interests were sold to a large, external investment entity. We all understand the reasoning for – and potential benefits of – corporate mergers. And many of us have lived through several such events over the course of our professional careers: some quite recently. In having done so, we also know the sobering statistics of ca. 70 to 90% failure rate, especially when integration of personnel and philosophies is mismanaged (https://hbr.org/2011/03/the-big-idea-the-new-ma-playbook). Can you recall Snapple? That product played a large part in changing the multi-billion dollar beverage industry and once dominated the market. But it now places well behind other products, arguably because Quaker understood distribution but they did not understand the people, the brand, or its culture. Surprisingly, they lost much of their $1.7 billion in branding value http://brandfailures.blogspot.com/2006/11/brand-culture-failures-quaker-oats.html. Corporate size and wealth are useless assets when a company is led by people who do not value their human resources or truly understand the business in which they operate. Nick Summers wrote an excellent article in Forbes Magazine (May 22, 2014) that summarizes this perspective with precision (http://www.businessweek.com/articles/2014-05-22/ibms-eps-target-unhelpful-amid-cloud-computing-challenges). It is a well-written story of how a large, global, established company with over 100 years of operational experience floundered and lost its corporate identity due to what I concluded was poor management practices. They were large and arrogant; pretending to be superior to their counterparts. They failed to value their client base; failed to motivate their personnel assets. And in their failures, they encouraged new competitors with vision, drive and freedom to innovate and develop new, improved technologies that changed their industry point forward. As we enter CY 2015, Provectus has set a solid scientific foundation in its sciences (see Resource Center). From here, you will see how we rapidly expand our operations internationally and integrate industry leaders as new staff and partners. We will be issuing documentaries from established peers, colleagues and clients who have come to recognize the technical attributes of our offerings. We will do this while respecting you, our clients, and providing the service to match the caliber of our technologies. Thank you very much for your confidence in us, and your business. Merry Christmas and Happy New Year. The environmental engineering community is notoriously skeptical of new technology, somewhat resistant to change, and sometimes difficult to influence. I suspect this is mainly because many of us have seen bad technologies fail – sometimes majestically. I knew well from past experiences that the development and commercialization of a new environmental biotechnology addressing an issue that not everyone appreciated was going to have its difficulties. If you are interested to learn how our industry responded to these new concepts and thought-challenges during our first year of operation. 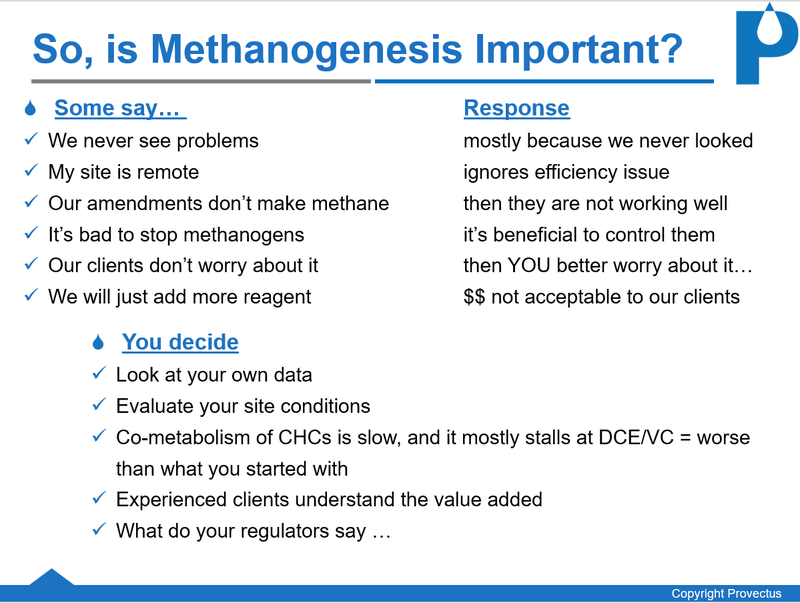 As we discussed with you Provectus’ technologies during workshops, technology transfer sessions, conferences and webinars the potential benefits of actively controlling methanogens during ERD and ISCR remedial actions were readily understood and generally accepted by most audiences. Namely: i) improved efficiency (first and foremost benefit), and ii) safer remedial actions via reduced potential for methane accumulation, induced migration of VOCs, and generation of secondary plumes caused by methylation of heavy metals. Simultaneously, I had the benefit of detailed interactions with genuine experts in the fields of microbiology, biogeochemistry, indoor air /vapor intrusion, and others so I know that these issues are very real, very important, and very valid to discuss. However, not all interactions went swimmingly. Last year I felt like I was that single voice. But more people join the choir each day, and the menu of remedial technologies is improving. This month marks our one year anniversary at Provectus Environmental Products, Inc. Over this short period of time, we made significant improvements to proven technologies, namely Provect-OX™, EZVI-CH4™ and AquaBlok-CH4™. In addition, we introduced a new concept to our industry – active control of excessive methanogenesis – using our Provect-CH4™ methane inhibitors as supplements to carbon amendments and/or integrated into our antimethanogenic ERD reagents (ABC-CH4™) and antimethanogenic ISCR technologies (Provect-IR™ and Provect-IRM™). Overall most clients, regulators, site owners, and industry practitioners appreciated our message and embraced the concepts inherent to our technology advancements. Stay tuned for more exciting changes! Onward and Upward. During my post-doctoral training at the U.S. EPA Environmental Research Laboratory in Gulf Breeze, Florida (1988 – 1990), my colleagues and I discovered a microbe with the ability to utilize high-molecular-weight polycyclic aromatic hydrocarbons as sole sources of carbon and energy for growth. Together with the U.S. EPA we obtained several patents on that core technology (US Patents 5,132,224; 5,242,825; 5,614,410; 5,910,245) and, in so doing, I had the distinct fortune to work with Mr. Roman Saliwanchik (1926-1999) who was the first attorney to successfully argue at the appellate level for the patentability of living microorganisms (View PDF). In other words – he patented the first microbe. In his book “Protecting Biotechnology Inventions: A Guide for Scientists” (Brock Springer, 1988) Mr. Saliwanchik teaches of the advantages and disadvantages associated with legal preservation of intellectual property rights. Of the advantages that I often recall, one main point was that a patent affords an individual the right to utilize their own invention. In addition, a patent gives one the right to stop others from copying, manufacturing, selling or importing your invention without your permission. There were also memorable disadvantages associated with obtaining a patent, including time and cost. But a main lesson was to be prepared to defend the patent against infringers. If you are not willing to police and protect your patent, then do not invest the requisite resources. Claim 3 of the 709 patent describes “The method of claim 1 wherein the steps of supplying said mixture and said organic hydrogen donor are carried out by placing an injection rod into the soil and then injecting them under pressure through an injection rod (emphasis added). Those who we missed with the intended message, as per a written commentary that stated: “…Further, as practitioners, you must be free to choose the appropriate methods of remediation without fear of unjustified claims of infringement or litigation”. Second, remember that a main attribute of a patent is to allow the individual the right to utilize their own invention and, by so doing, try to recoup the investment made into technology development and its commercialization. These are very real costs, and without the possibility to earn return on those investments the engines of creativity and capitalism would stall, to everyone’s misfortune (e.g., need a new antibiotic? It is not forthcoming). Third, it is inherently unfair to formal licensees such as Provectus – who respect patent law and thus obtained a license for a fee – to be at a cost disadvantage to those who disrespect and misappropriate patented technology. When someone is infringing a valid patent, a first step is typically a carefully worded letter to the potential offender to rectify the problem. Where that fails, mediation or another type of dispute resolution to negotiate with the infringer should settle the matter. One can also obtain impartial opinion on issues concerning validity or infringement of patents. These steps often allow both sides to present their respective opinions and they often result in mutually beneficial arrangements. “Truth is mighty and will prevail. There is nothing wrong with this, except that it ain’t so” (Samuel Clemens, 1835-1910). I once found myself under new management after my company was acquired by another firm. During this Holiday time of the year, I offered a Christmas message similar to what I have done during my entire life. Shockingly, I was directed to “not use the words Merry Christmas”. I was told to not even write those two words in emails. The reason being? To not offend or upset others who might not celebrate Christmas. The irony of it all was that the directive was a direct assault on my rights and beliefs, and one that I found truly offensive (and yes, this was in the USA). So I gave them two alternate words – granted somewhat less festive ones, perhaps – and very publically continued wishing everyone a Merry Christmas via all forms of communication at my disposal. That pretty much set the tone for my future there, but I did not realize at the time what a special and unique gift I was actually given. Namely, motivation to invoke change which morphed into an exit path and ultimately resulted in the establishment of Provectus and our exciting technology portfolio. Please accept our best wishes for a Merry Christmas, Happy Hanukah, Happy Holidays and Happy New Year! Thank you very much for making our first full year a great success. Circa July 2014, Provectus widely introduced to our industry the concept of controlling methanogenesis during in situ remedial actions that employed conventional ERD or ISCR technologies. Since that time, we have effectively integrated our Provect-CH4® antimethanogenic reagents (AMR) into ERD-CH4®, Provect-IR®, Provect-IRM®, EZVI-CH4™, and AquaGate®-CH4™ (multiple patents issued/pending) yielding improved (i.e., safer, more efficient, more effective, and less expensive) remedial amendments. And we have successfully applied millions of pounds of these improved products at multiple sites throughout the USA, Europe and Ocean Asia. Based on previous experience, we knew well that the introduction of an entirely new concept and associated technologies would generate discussion and debate. While critical, most of these interactions were professional, mutually respective, and productive. But others were simply obfuscations from vendors of conventional/outdated wares who resisted progress and inevitable industry change. Moreover, we knew that as recognized technologist and seasoned practitioners the industry would rightfully expect from us more rigorous documentation of efficacy and proof of performance than it would expect from others who might introduce a new flavor of a cloned technology. As you likely surmised, the “Professional Skeptic” category represents the majority of our colleagues. They generally accept and acknowledge the importance of excessive methanogenesis but maintain a reserved position of neutrality until further evidence convinces them that AMR chemistries and our advanced remedial products are valid and effective. In this Newsletter, we provide information that should help in that transition. To our readers who became valued clients and gave us the opportunity to demonstrate our technologies, we thank you for your leadership, forethought and confidence in us. These are the efforts that yield critical laboratory and field data needed to complete the modernization of conventional ERD and ISCR technologies.